GUATEMALA CITY, Oct 29 2012 (IPS) - “I heard about the Zero Hunger plan on television, but unfortunately it has not arrived here,” complained Elías Ruíz, a small farmer in the southern community of Santa Odilia, about the Guatemalan government’s flagship programme to end poverty. “Projects to increase production would benefit us, because without them, we have no way to support ourselves. They could help us with maize seeds, plantains (starchy bananas for cooking) and fertilisers, and techniques to improve production,” said Ruíz. Every rainy season, Ruíz and 307 other families in Santa Odilia, in the municipality of Nueva Concepción in the province of Escuintla, have to deal with the fury of the Coyolate river which bursts its banks and floods their houses and food crops. “Our cattle die and our maize and plantain crops are all destroyed; we have to start over,” he told IPS. Like Ruíz, hundreds of thousands of Guatemalans suffering from food insecurity are still waiting for the Zero Hunger plan to reach them and their communities. The programme was launched in February by right-wing President Otto Pérez Molina, a retired general, a month after he took office. But it has yet to become a reality for many of its potential beneficiaries. “Too few resources are devoted to the fight against malnutrition, and there is a lack of coordination among the different institutions and public policy programmes,” said Jonathan Menkos, executive director of the Central American Institute of Fiscal Studies (ICEFI), a local NGO. In the case of another programme, the “1,000 Day Window” which supports mothers from pregnancy until their children are two years old, only 36 percent of the budget had been disbursed. Menkos told IPS that one problem of the package of programmes is its insufficient budget. As an example, he said investment in food and nutritional security for 2012 is 668 million dollars. “Neighbouring countries like Honduras and Nicaragua, with lower levels of malnutrition, have invested about twice the amount Guatemala has done in recent years,” he said. Menkos said another problem with Zero Hunger is the lack of clarity with respect to its resources, because it groups together and updates existing programmes and establishes new ones. When he inaugurated it, Pérez Molina said the plan would require 260 million dollars more than the present budget for the areas covered. The plan brings together a series of scattered initiatives into a united programme of action, but its management is still uncoordinated between the ministries and agencies responsible for its different components. 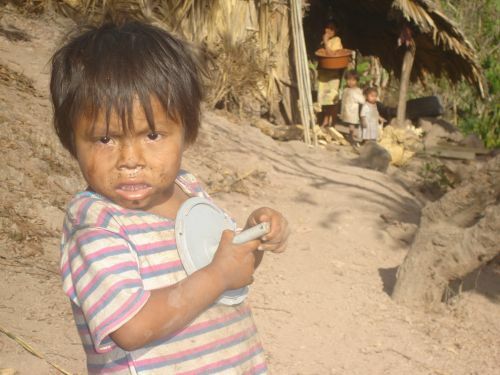 This country has the highest rate of chronic child malnutrition in Central America, and one of the highest in the world, at 49.3 percent of children under five, according to the United Nations Children’s Fund (UNICEF). In Guatemala, 54 percent of the country’s 15 million people live in poverty, and 13 percent in extreme poverty, especially in the rural areas that are home to 54 percent of the population. To deal with these situations, Pérez Molina launched Zero Hunger, which includes actions like the programme for mothers, promotion of business chains for small rural producers, financial support and production of fortified maize tortillas, the staple food. Among the government’s goals is tending to over one million children suffering from chronic malnutrition and reducing their number by 10 percent by 2016, the end of this government’s term of office. However, there are several problems still to be solved in order to reach this goal. “There are major challenges regarding institutional integration and coordination, and there is also a need to evaluate what is being done,” said Menkos. This last point is key, according to Iván Yerovi, the deputy representative of UNICEF in Guatemala. “In my view, this is the great commitment the country must make. It would be ideal to have more resources, but it is even more ideal to monitor and know how those funds are being used,” he told IPS. “Unless we analyse each one of the interventions that are being made, it will be too late when we reach the sixth or eighth year to carry out a survey of mother and child health to find out the results,” he said. Yerovi agreed with Menkos in his concern over the lack of disbursement of the budget for combating hunger in the country. “This late in the year, the figures are not showing adequate implementation of the funds. This is a lesson we have learned, and this should be corrected,” he said. NGOs also criticise the plan’s methodology. Aguirre was referring to “Bolsa Segura”, a programme for distribution of food provisions to low-income families initiated by the government of social democratic president Álvaro Colom (2008-2012) that was heavily criticised as being used for political ends. “They’re giveaways for the population that don’t solve the fundamental problems of malnutrition and guaranteeing the right to food,” he said. Instead, Aquirre favoured productive projects for growing basic grains, with technical assistance to strengthen the peasant economy. “The resources devoted to fighting malnutrition are minimal. The Zero Hunger programme is not taking off, and we are seeing a fragmented strategy, without interconnection between the different ministries in charge of the plan,” he said. Despite everything, in Menkos and Yerovi’s view it was positive that the plan had put the issue of hunger higher up on the government agenda, reinforcing the trend of recent years. And in September, former U.S. president Bill Clinton, on behalf of his foundation, the Clinton Global Initiative, recognised and honoured Pérez Molina’s efforts to reduce malnutrition through the Zero Hunger plan. repeated threat/attack from Nature – Australia, Africa, NewZealand, Brazil, Pakistan, Japan, Iran, Myanmar, Thailand, USA, Russia and Indonesia.